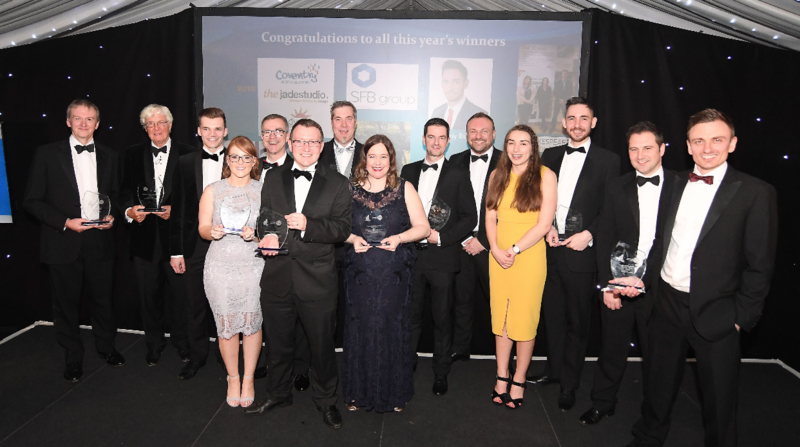 The winners of Coventry & Warwickshire First’s FirstPro 2018 were announced at a gala dinner held at Coombe Abbey on Thursday 19 April. In the gift of Coventry & Warwickshire First’s board, the Outstanding Achievement award recognises the exceptional contribution of an individual in the past year. This year, however, the outstanding achievement of the year was delivered by the City of Culture Trust Team securing City of Culture 2021. Their efforts mean Coventry can take centre stage and show the world all the city has to offer. Communication Campaign of the Year: City of Culture Trust, Advent Communications and The Jade Studio. Integral to the bid for City of Culture 2021, the communication campaign told the city’s story to the local, regional and national audiences. The brand was strong and energetic and the campaign was built on lateral thinking, creativity and the thoughtful integration of all elements. Deal of the Year: SFB Group. Faced with its existing bank pulling out of the sector, the hospitality and leisure business turned to SFB Group to refinance and so secure the business. The team secured offers from two potential funders and then managed a six month negotiation process as the goal posts shifted. By getting the deal away they secured the future of this important local business. Property Deal of the Year: EDG Property. EDG Property is transforming the 1950s Co-operative building into a mixed-use destination to include a collection of high spec. apartments, a private internal residents’ park and members’ lounge. The £15m scheme represents a significant investment in the city and will catalyse further regeneration. Genuinely aware of the need to invest in its people, Shakespeare Martineau created the Academy. Open to all employees, its aim is to stretch employees’ knowledge and capability and to dissolve barriers to progression. The judges were particularly impressed by the positive feedback from employees at all levels of the business. Team of the Year: HB&O. Teamwork is at the heart of HB&O’s approach, collaboration being embodied in the vision statement. Working as a firm-wide team, they have delivered strong year on year growth, been proactive in the region and raised more than £11,000 for charity. The judges gave a special mention to Coventry & Warwickshire LEP. The team has secured significant inward investment and was recently ranked in the FDI European Cities & Regions of the Future Awards 2018/19 top ten LEPs (ranked fifth). Their achievements are built on their collaborative approach to working with other organisations in the region. Young Professional of the Year: Andriy Buniak. Andriy stood out as exceptional, both at work and in terms of his contribution to the local community. At work he has been recommended in the 2016 and 2017 editions of the Legal 500. Outside work he organised his firm’s participation in the Alzheimer’s Walk and mentors A-Level students, amongst many other activities. Property Deal of the Year sponsor: The HR Dept.